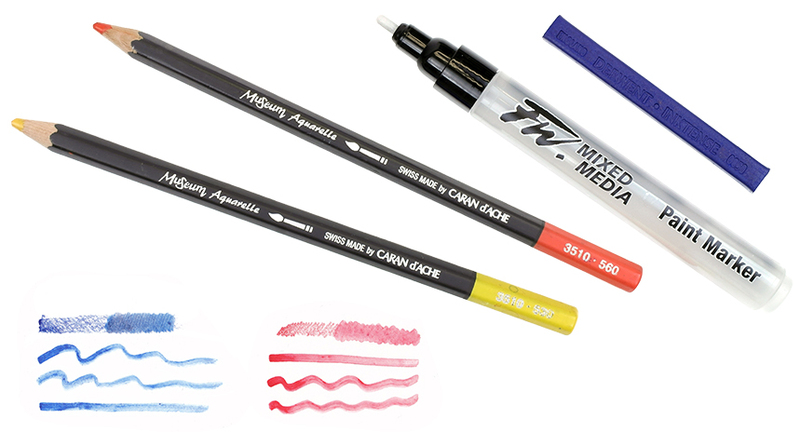 FW Mixed Media Paint Markers can be filled with a great range of different mediums. Although they are designed to work seamlessly with Daler Rowney FW Inks, you will find that they also work brilliantly with a whole wealth of other liquid media! An extensive list of coompatible media can be found below. Daler Rowney FW Inks are an acrylic-based, water resistant ink which have between 3 and 4 star ratings for permanence. This high degree of lightfastness makes them ideal for the creation of artwork for permanent display. The inks are pigment-based which means they give good colour strength and fluidity. The colours can be substantially diluted to achieve the most subtle tones, very similar to watercolour. Such washes will dry to a water resistant clear film and successive layers can be laid over in a highly predictable manner. Whilst standard FW Inks work seamlessly with the FW Markers, we DO NOT reccomend using them with pearlescent inks. Such inks contain tiny particles that can block the fibre tipped nibs of the marker and prevent them from working effectively. FW Inks are available individually, or in a variety of sets. More information about the permanence and opacity of each of the inks can be found here. Liquitex Professional Acrylic Ink! is a range of extremely fluid acrylic that use super-fine pigments in a state-of-the-art acrylic emulsion. They dry quickly, are permanent, water resistant and non-clogging, which makes them ideal for a variety of techniques. Liquitex Inks also have a dropper in the lid which comes in handy when you're filling up your markers. All the colours from this range are completely intermixable, so if you can't find the colour you're looking for you can always mix it! Liquitex Ink! is available in individual colours. Winsor & Newton Drawing Inks are formulated from a series of soluble dyes in a superior shellac solution, and are presented in an iconic little bottle. They are very versatile and are a favourite amongst illustrators, designers, calligraphers and artists. These brilliant colours are fast drying and water resistant, easily diluted and have excellent adhesion to most sized surfaces. Available in 26 colours, including Liquid Indian Ink - a water-based solution of traditional Chinese stick ink. All the colours are intermixable and you can overlay different colours for new effects and shades. You can use a pipette when filling your FW Mixed Media Marker with Drawing Ink to make the process less messy! These drawing inks are available to buy individually or in two different sets. 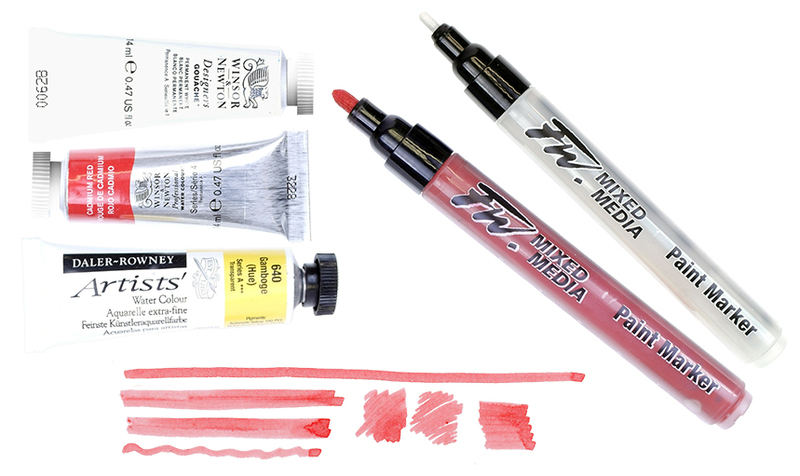 We stock a range of watercolour paints that can be diluted and used with the FW Markers. Using watercolour paints means there is infinite colour choice at your fingertips as colours can be custom mixed to make beautiful blends to suit your artwork. Watercolour paints can easily be diluted to a thin consistency and can be loaded into the marker using a pipette. By pre-mixing your colour outside the marker barrel you can ensure that the paint is properly dispersed, so you will get a clean, even wash.
Alternatively, you can fill one of your markers with pure water. Once the water is in the tip it can be used to lift colour from a pan, as you would do with a brush using traditional watercolour painting methods. Brusho really is a one-of-a-kind, unique painting medium. The colours are a transparent, highly-pigmented water-colour ink that comes packed in small drums which contain the dry, crystalline powder. Available in an extensive range of exciting colurs, they mix instantly with cold water to produce a painting medium that is renowned for its versatility. Brusho allows you to create visually stunning, expressive artwork with the minimum of fuss. Brusho can be diluted to a thin consistency and put in the FW Marker with ease. You may find that a pipette comes in handy when filling the barrel! By combining the vibrant nature of Brusho with the convenience of a marker pen you are able to make vivid marks with no trouble. All Brusho colours are fully intermixable, so you can combine them to create your own colours to suit your artwork. Bruso Crystal Colours are available individually and in two sets. We also stock a range of accessories will be useful if you plan to use Brusho in your artwork. When using the FW Markers it is not always necessary for the colour to be used straight from the barrel of your pen; dry water-soluble colour can be lifted with a wet nib to create an array of interesting effects. We stock a number of different dry colours, from water-soluble sticks to watercolour pencils. The same can be said for water-soluble colour like Derwent Inktense blocks and Winsor & Newton Watercolour Sticks. These blocks are great for laying down large swathes of colour, which can then be washed down with water. Colour can also be lifted from these blocks using an FW Marker filled with water. Other watersoluble blocks include Caran d'Ache Neocolor II and Reeves Watersoluble Pastels.